Drawings of Four Seasons constellations by Katsuhiro Yamazaki; photos by Elliot Selick. 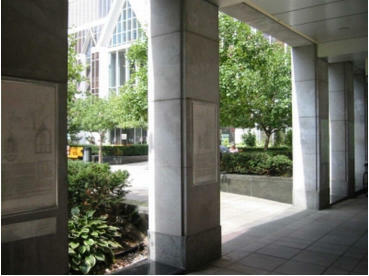 Four stainless steel plaques are mounted on the cloister pillars of the Union Street entrance to the courtyard behind Christ Church Cathedral. Each of the plaques illustrates the stars that are visible from the courtyard during one season. 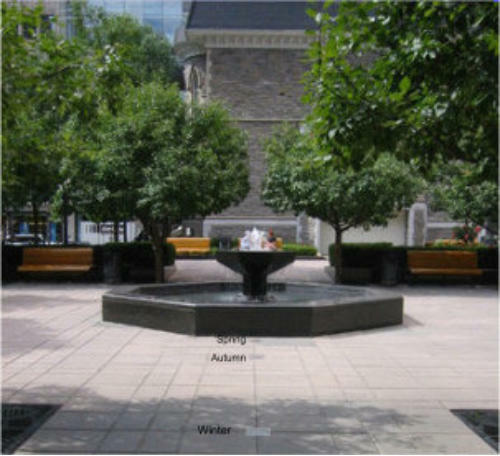 Another set of four 6" stainless steel plates are embedded in the courtyard’s paving stones, each with the name of a season engraved on it. These markers indicate where viewers stand to see each season’s alignment between stars and architecture.